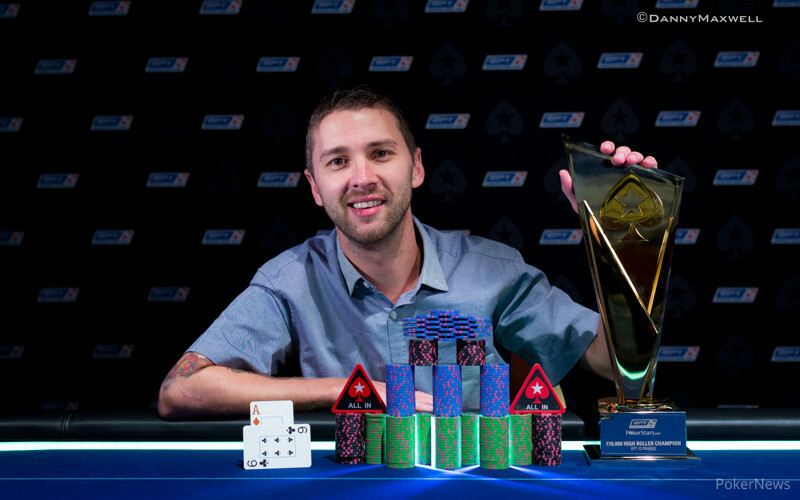 Kenny "kenny05" Smaron Wins EPT Prague €10,300 High Roller for €595,500! The 2015 PokerStars European Poker Tour Season 12 Prague €10,300 High Roller attracted 315 entrants, which created a €3,150,000 prize pool. On Wednesday, the final 18 returned to battle down to a winner, and when the dust had settled, Kenny "kenny05" Smaron emerged victorious to capture the €595,500 first-place prize. For Smaron, who will turn 31 on Christmas Day, the win was by far his largest live cash to date. In fact, prior to this one he had just $202,744 in live tournament earnings with his largest cash being $90,175 for finishing third in the 2008 World Poker Tour Doyle Brunson Five Diamond World Poker Classic. Smaron, who finished 91st in the EPT Prague Main Event for €11,540, is best known for his online exploits where he plays high-stakes six-max hyper sit-n-gos on PokerStars. Originally from Philadelphia, Pennsylvania, the online poker expatriate now splits his time between Costa Rica and Colombia. "I played like a savage at this final table," said Smaron, who hadn't played in an EPT for nearly five years. "It was finally my time." The day kicked off with a flurry of eliminations; in fact, it took just three levels for 10 players to fall and set up the final table. Among those to exit early were Artem Metalidi (18th - €31,480), Nicholas Palma (17th - €36,060), Bryan Paris (16th - €36,060), Mikkel Lokkegaard Hansen (15th - €40,640), William Foxen (14th - €40,640), Luc Greenwood (13th - €45,220), Mihails Morozovs (12th - €45,220), Aleksandr Denisov (11th - €51,330), and Kevin MacPhee (10th - €51,330). In regards to MacPhee, he began the day as chip leader and was looking to close out his very impressive 2015 with another big win. Unfortunately for him, he fell after he opened to 60,000 and was three-bet to 215,000 by Smaron. MacPhee responded with an all-in four-bet for around 900,000, and Smaron insta-called with the . MacPhee had the , and he looked to have earned a reprieve when the flop came into view. But, he then fell behind on the turn. After the hit on the river to seal his fate, MacPhee headed to the cashier's cage. 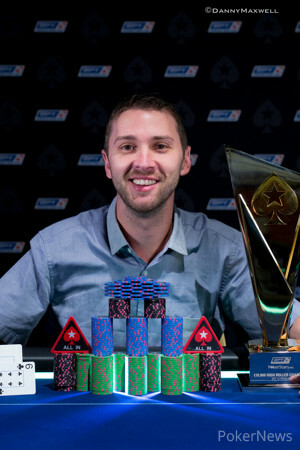 The elimination of Davidi Kitai came a short time later and set up the official final table of eight. From there, Team PokerStars Pro Vanessa Selbst fell in eighth after shoving with the and running into the of Felix Bleiker. She was soon joined on the rail by Rocco Palumbo, who was the loser of two back-to-back hands, and then Daniel "Jungleman" Cates, who grew short only to shove into two pocket pairs. The smaller of those pairs, held by Greece's Iliodoros Kamatiakis, ended up getting crippled in the hand, and then he lost a race to bust a short time later. By that time the blinds were getting big, so it was no surprise to see Ihar Soika go with queens in a three-way all-in pot. Two players managed to survive, but the Belarusian was not one of them. Three-handed action took awhile, but eventually the blinds whittled away at Bleiker, who fell when his failed to get there against the of Smaron. That set up a heads-up match with Smaron holding a more than 6-1 chip lead against Jaroslaw Sikora. For as long as three-handed play lasted, heads-up play was just the opposite, as It took just two hands for Smaron to seal the deal. 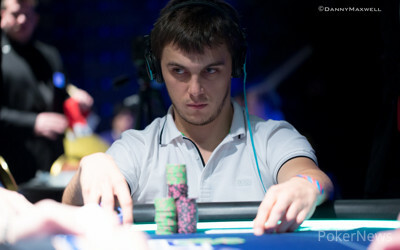 Jaroslaw Sikora is the runner-up, busting during the first couple of hands of heads-up play. Sikora pushed all-in for less than 2 million with and Kenneth Smaron called with . Five community cards later and the board read , busting Sikora in second place. Felix Bleiker has bust in third place here in the €10,300 High Roller, sending the tournament into the heads-up stage. Bleiker pushed all-in from the button with what turned out to be and Kenneth Smaron called in the big blind with . A final board reading sent Bleiker to the rail. There was a scheduled 60-minute dinner break but the heads-up pair have opted to take a 15-20 minute break before coming back to play for the title. Jaroslaw Sikora opened the button for 250,000 and was met by a three-bet to 625,000 by Kenneth Smaron in the small blind. Sikora made the call and then called a bet of 475,000 on the flop. When the appeared on the turn, Smaron waited for a bit and then moved all in. Sikora hit the tank, counted down his chips, and then released his hand. Felix Bleiker was one card away from becoming the third place finisher, but Lady Luck shone down on him and he's still in contention for the near €600,000 first place prize. Bleiker pushed all-in for 1,070,000 from the small blind with and Jaroslaw Sikora called from the big blind with . Bleiker looked dead and buried by the turn of th board, but the came to his rescue. 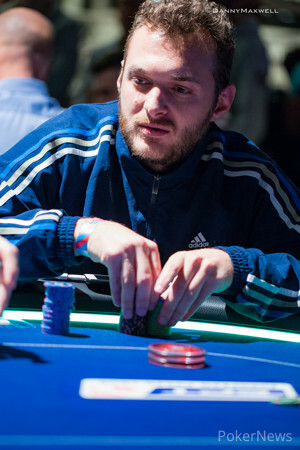 Jaroslaw Sikora raised to 275,000 from the small blind and received a called from Kenneth Smaron in the big. The former then bet 225,000 on the flop, the latter called, and the dealer burned and turned the . Sikora bet again, this time 375,000, and Smaron came along to see the river. Sikora bet for a third time — firing 525,000 into the pot — and this time Smaron pushed back with a big raise to 2.35 million. Sikora wasted little time in folding. Kenneth Smaron has been the more aggressive of the final trio, but has slipped into second place n the chip counts after clashing with Jaroslaw Sikora. Smaron opened to 200,000 and Sikora called in big blind. Sikora then check-called a 250,000 bet on the flop before leading for 225,000 on the turn. The river was another club, the , and Smaron folded to a 775,000 bet. Who Will Win the €595,500 First Place Prize?